Can you feel it? Autumn is fading in & I am delirious. I love that combo of white, hot summer sun beating down through misty early-fall air. Everything smells like dirt & fire. We’ve got the Page of Cups on the scene: a dramatic, sensitive player at odds with the alpha-vibe that the 5 of Wands wants to draw out of her. Her heart is probably fluttering at the 10 of Crystals as well: a pleasant sign about her immediate environment, but tinged with foreboding. To everything turn, turn, turn. She’ll need to shore up on the emotional resources she already has in spades. We’re dealing with a court card & the Minor Arcana, so this week’s Tarot Cast activity is a mild one that might clear away huge emotional blockages! The goal is to tune in, but to clear up some static, we’re going to look outward. The 5 of Wands symbolizes creative challenges & Awakenings. Challenges that shatter your self-unity, in order to re-infuse you with wiser, stronger spirit. This is how you graduate into a newer, brighter self-awareness. 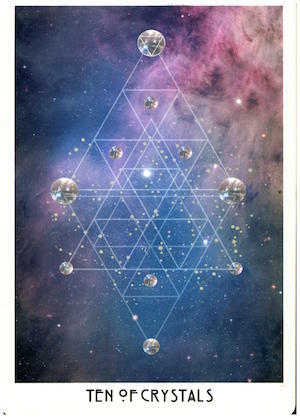 Numerologically, 5 is the number of change, & the Wands suit corresponds with spiritedness & creation. The Wands speak to our spirit-fire: our core animating force. I think of the Wands suit as symbolic of having the combination of True Grit & Bright Faith. Fire makes its own light; can melt & fry everything in its path… until it encounters an element with enough mass & speed to extinguish its raging roll. Instead of trying to consume & metabolize your obstacles, the 5 of Wands shows what happens when you are jarred into stillness. The Crystals suit corresponds with your physical environment, your material gains, & practical matters. Numerologically, 10s are cumulative & re-cyclical. Beginnings & endings. If you want to celebrate the full-circle moments, the number 9 carries a sweeter vibe, whereas 10s are tinged with bittersweetness. Picture the interior of a cozy, vibrant home, decked with stylish autumn decor (glass-blown pumpkins; clusters of fat, gooey soy-based candles, fragrant like burning leaves & nutmeg). The family is milling around, chittering, giggling, gushing with back-to-school news & holiday fantasies. Now let this image ominously fade into darkness… or lightness. Like a movie, with an orchestra accompaniment. Credits start rolling. That last scene is totally happy… right? A little ambiguous, but pleasant, for the most part. This chapter ended on a high note & can go anywhere from here. PAGE OF CUPS: IN TIMES OF CHANGE & SHIFTING, EMOTIONAL RESOURCEFULNESS IS YOUR SAVING GRACE. The pages of all the suits (Cups, Wands, Swords, Crystals) always correspond with the Earth element. The Cups technically corresponds with the element of water: the archetypal evolution of our relationships & inner world. This realm’s evolution is fluid; tending to conform to whatever contains it. In last week’s Tarot Cast, I walked you through a little Alchemist’s Arithmetic (intuiting the feel of court cards in the Tarot by combining the elements they symbolize). Well, pages in all the suits correspond with Earth; pages demonstrate the resources of the suit. So, the Cups’ resources would be intuitive, emotional, & visionary. If symbolizing a true-life person, the Page of Cups would be young & theatrical. One day she’s wearing a flannel bedsheet as a toga, insisting to be called Cassandra; the next day she’s wearing a bucket hat & yellow-tinted aviators, narrating her life out loud & referring to herself as Raoul Duke. She would have more BFFs than most girls have friends. Emotional sensitivity is her personal genius. If she were a literal water source, the Page of Cups would be a babbling brook: bouncing & wrending along her own path. The Page of Cups arriving in this week’s Tarot Cast indicates that emotional resourcefulness is the necessary quality for shoring up against a faltering self-confidence. You don’t need to get aggressive, you just need to tune back into you. And stop pushing. Instead, get very, very still. Try to absorb the subtle motions occurring in your immediate environment. What does the room & people in it reflect about what’s going on with you? They’re not as separable as you think. However you read your environment shows you what’s going on in your mind-body-soul. Maybe you’re not going through a crisis right now. Maybe you’re feeling on top of the world. You’re back-to-school wardrobe is on-point, you’ve got a madly luxurious work sched, & you can smell Halloween on the wind. But crisis is inevitable. We expand by way of friction. So, even if you’re not going through a dark night of the soul, this may be the perfect time to start stockpiling your psychic reserves--for when your usual True Grit / Bright Faith shutters off & you’ve got to snap back to your core. Snapping back to your core is the only way to get true perspective! Sure, no one wants their ego to get knocked off its grind, but when is does, don’t you want it to land someplace supportive? So, here’s a little exercise: grab your diary & sit down in the very center of your bedroom, living room, or whatever room you believe is most representative of you. Spin a playlist if you like & brew a little tea. Now, take inventory of the space. Be detailed. What objects, colors, textures, & words (from posters or the bindings of your books) jump out at you? What objects are on the top shelves of your bookcase? Are there any overdue library books lying in plain sight or unopened bills piling up on the desk? List everything in your diary. Go until you have to squint to start noticing objects, or now you’re just listing furniture. Have a sip of tea & maybe skip to your favorite song on the playlist. Review your list. In different colored ink, annotate each item with the reason why it’s prominent in your space. What does it mean that your twin-sized bed is overloaded with quilts & pillows? What do you have to say about those unopened bills floating around or those clearly overdue library books? Why haven’t they been dealt with? Try to answer instinctively & be sure to explain each item, no matter how trivial. If it could help, set a timer on your phone for 10 minutes, so you can hurtle through the list without thinking about crossing anything out. When you have your inventory & the meaning behind the items in your inventory splayed out in front of you, do a little analysis. What objects occupy prime real estate in your psychic universe… & what feelings do they evoke? Are they front & center because they’re inspiring & make you feel good, or are they where they simply because you don’t have any other place for them? If you like, you can fill up one more page in your notebook, divided between Stuff I Love In My Psychic Universe & Stuff I Loathe In My Psychic Universe. You might start with listing tangible objects from the room, but you’re almost guaranteed to also list some emotional gristle you need to work out. The stuff in your inventory that makes you feel icky, stressed, or straight-up bad: those are challenges. You might be a little temperamental about the associations attached to those objects, because you don’t know how to deal with the feelings they evoke. The space those objects occupy symbolize vulnerable areas in your psyche: something that you should start developing the emotional wherewithal to start dealing with now, before they become a crisis, & you’re caught with your pants down & no emotional resources to draw on to deal with it. The stuff in your inventory that inspires you & makes you feel good: those symbolize your emotional strengths. Are you surrounded by pics of your friends & family? Are your shelves bulging with tokens of love? Are the walls mottled with personal artwork showcasing your dreams & visions? The most crucial Q: are you filling your external world with mostly items reflecting the best, most useful reserves in your inner world? Are you surrounded with memories & inspiration that stokes high vibrations? Is your business & / or school paperwork tidy? When you look around, do you feel confident? Remember: how you perform this task reveals how you process the environment around you. Your environment mirrors your psyche. And in this activity, you’re basically looking at yourself looking at yourself. If there’s stuff you want to skip, gloss over, or altogether ignore, make a note of that. Fengshui your space around what makes you feel beautiful, inspired, powerful, & happy. That could mean rearranging the entire room around what you love doing, like creating a permanent yoga studio in the corner, where the morning sun shines through the window. It could also mean investing in new furniture, like finally buying a proper bookcase, so you can display your books instead of stacking them sideways against the wall. And of course, vision boards! Get proactive with regularly-occurring, stress-inducing paperwork. I grew up in a household where no one was allowed to answer the phone, though it rang every hour. It was always a debt-collector. We also never checked the mail--maybe once a month or around birthdays. When I grew up, I trembled at every bill that came out of my mailbox. I had the money to pay my bills (& even paid them online ahead of time! ), but having the actual documents floating around my apartment made me queasy. I had to develop a system to process & file that paperwork, so I could move it out of sight ASAP. (Without ignoring it!) If you vibe with that, I talk more about developing proactive habits in this post. Most importantly, go out into the world. Create experiences that will generate happy feels. This is the surest way to stockpile (& practice drawing on) your emotional resources. This week’s Tarot Cast is about getting proactive against those potential dark nights of the soul. And if you only take away one tip: make it that last one! Go out into the world. Have experiences. In fact, the more time you go out (meeting people, taking pictures, visiting unexplored parts of the city, sampling new restaurants, & taking curious new classes), the more resources you’re stockpiling. The more practiced you’re getting on reaching into & using those resources. And when you first come home (especially after a long day out), notice what you notice about your space. If nothing else, I hope this post emboldens you to simply walk right up to any of your stuff & fling it on the ground--no hesitating to hem & haw about the significance of why you have it. If it doesn’t like your heart up like a pinball, offload. Free up the space for good, delicious feelings you’ll need. Tune in again next week for more Tarot Casting! And if you’ve got pics or insights from doing this week’s Tarot Cast activity, Tweet them at me! All Starchild Tarot images by Danielle Noel.